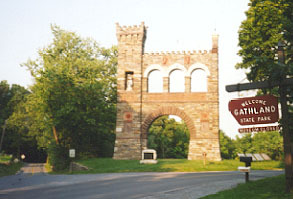 The Gapland Road outside of the historic district of Burkittsville, Maryland, winds over the hills and through the valleys to the state park dedicated to Civil War correspondents. [The memorial arch is shown below. - Jonah] The area was the scene of vicious battles during the Civil War, and one in particular is worth noting. For days Union and Confederate forces marched toward Burkittsville in anticipation of a battle that would determine strategic control of a large area. At dusk the day before the expected encounter, only a large hill separated the two armies. Scouts from both sides saw the fires in the opposing camps, and the night before what would assuredly be a deciding battle, there seemed to be a charged atmosphere of anticipation and restlessness. The commanders of the Confederate forces had no intention of spending a tranquil night before battle. Troops were quietly mobilized to draw the cannons and ammunition to the top of the separating hill, in order that Rebel forces could gain a strategic advantage during the night by being able to fire down on Union soldiers rather than scrambling for control of the hill when morning came. The horses were quieted and the men stealthily began pulling the implements of war toward the ridge. Hopefully they could gain the position before the Union soldiers awakened. Alert Union scouts noted the unusual activity during the night, however, and immediately reported the Confederate mobilization to their commanders. No reveille sounded, and no bugle called. But the Union soldiers were awakened, quickly assembled, and armed. Torchless, the Union army ascended the hill and silently took positions. Heavy artillery was left behind. Below, Confederate troops were struggling with the heavy cannons, 'pushing and pulling them up the face of the hill. Without warning the Union troops charged, firing into the surprised and unprepared Rebel soldiers. Cannons were abandoned and rolled down the hill as soldiers scrambled for cover and ammunition. Relentless Union soldiers pursued, slaughtering thousands. Remaining Confederate troops regrouped and hastily retreated as the sun rose on the day the battle was supposed to have taken place. For more than a century residents of the area have seen campfires materialize on open fields and in wooded areas both adjacent to this battlefield and at various locations on South Mountain. Occasionally several phantom-like soldiers are seen stirring fires, but upon closer examination both fire and figures vanish. There is an eerie, intangible quality to the area on certain nights, but that hill - as well as Cherry Lane near Braddock Heights - is not wholly devoid of more tangible evidence. Many people have taken their automobiles to the location outside of Burkittsville, where the road ascends the hill described. Turning off the ignition and putting the gear shift in neutral, one can sit at the base of the hill ... then silently begin rolling up the hill, powered by unknown means. It is told phantoms of the Confederate army continue to haunt the area, pushing vehicles up the hill as though they were cannon. No scientific explanation has been offered that satisfies those who know of the haunted hill . . . and the curious phenomena continues to this day. Spook Hill: Spook Hill is located just outside of Burkittsville, Maryland. From Harpers Ferry, take Route 340 toward Frederick, Maryland, and at the third exit over the Maryland bridge, take the exit clearly marked. Turn left off the exit ramp and drive six miles to Burkittsville. At the square in Burkittsville, turn left again, and drive half a mile to the town limits. You will see a barn on the left. Slowly drive up the hill where, at the top, you will see several historical markers on either side of the road. Now slowly drive almost to the bottom of the hill and stop. Put your car in neutral and turn the car off -- but watch out for cars coming over the hill. You will coast up the hill and defy gravity! ..or so goes the legend. I tried this in 1985, in the '75 Porsche 914 I was driving at the time, and the ghost Rebs didn't bother. When questioned about it, one of the locals said (in unforgettable grammar) "It don't always work half so well." Maybe they don't like German cars. My pard "Spanky" recalls this incident: "In the early 80's some pards and I dressed in our Confederate uniforms, hid at the spot, where the ghost would push cars up the hill, and when cars pulled up WE would push them up the hill. The faces on the people in the cars were priceless. The best was a car full of high school girls. One in the back seat turn in looked right into my face; she let out the loudest scream I have ever heard. The car took one jerk forward and was gone, and we jumped back in the woods. I laughed so hard my sides hurt for hours..."